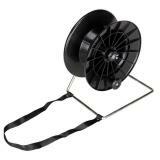 For extra capacity, consider our EzeReel XL™ Wind-up Reel. Pre-winding available—If you would like our conductors pre-wound on an EzeReel, please choose from the options shown within the Accessories tab below. 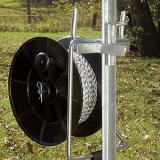 You can hang the EzeReel Complete by using brackets (sold separately). 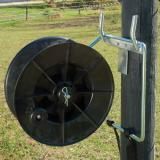 Can also hang the EzeReel Complete on either wood or steel posts by using brackets (sold separately). Pre-winding available—If you would like our conductors pre-wound on an EzeReel, please choose from the options shown on the accessories tab above. 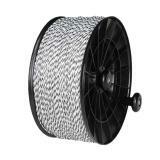 Much better reel than the early to late 1990's stuff that used a screw down tightener and rubber friction pads... those were terrible! I had to drill out the spool tie in hole for the larger 6mm electric rope. 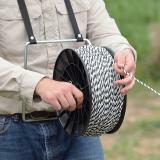 Once that is done no problem securing the rope to the spool before winding. The other maddening thing is that the neck loop, the strap used to wind-up after hanging on your neck, has the loop permanently riveted to the spool frame so you have to leave the nylon loop attached to the spool/frame assembly when mounting it for use after deployment. It would be nice to have snaps on the end so you can remove the strap and not have to leave it in the field over a long period of time as the UV will destroy it very rapidly! Version upgrade 2 or 3? Works like a charm. 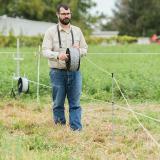 I use these to cross fence to subdivide pastures. 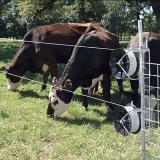 Easy to hang the locked spool on the perimeter barbed fence. It took less than fifteen minutes to erect a two strand 80m fence with step in posts on rugged terrain. 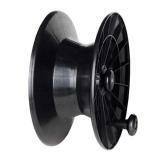 I had to shim one reel with an added washer to get the lock pin to engage. Based on reading the other reviews, this is not uncommon. My only regret is not buying this years ago. 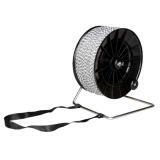 I purchased the complete Reel pre-wound with 660 feet of rope. Very good product. I have had no problems except the spring on the locking pin is weak and vibrations can drop back in a hole when I'm unrolling the rope. Other than that I like the system. The hitch pin was missing from one frame and the locking pin on one frame does not line up with the holes in the reel.